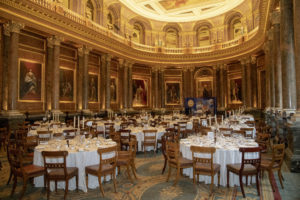 Drapers Hall was the location for the 2018 Institute of Demolition Engineers AGM and Annual Luncheon. 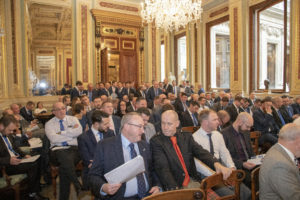 Yet again, the event was another sell out and marked the end of David Darsey’s two-year reign as IDE President who handed over the President’s chain to Gary Bishop. The day’s proceedings commenced with Mr Darsey thanking the Council of Management and the staff at Eagle Court along with his colleagues at Erith for their help and support throughout his term as President. 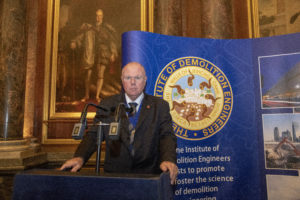 Mr Darsey went on to say that he was extremely proud to have been President at a time when the Institute has seen a rise in membership along with the delivery of the Demolition Degree course with the University of Wolverhampton. An area Mr Darsey holds close to his heart is the generous nature of the Membership and the NFDC who in total have raised £20,000 for Niemann Pick UK and £30,000 for the Helen Allison School, two charities closely associated with the outgoing President. In conclusion, Mr Darsey said that he hoped he had done the post justice throughout his term in office and wished the Institute the very best for the future. Mr Darsey’s final act as President was to present David Sinclair with an Honorary Fellowship of the Institute for his services to the demolition industry worldwide. Mr Sinclair collected his award before thanking the Institute and his compatriots for their development and advancement of the industry and in bringing it to where it is today. The finances of the Institute were then delivered by Erith’s Stuart Accleton who was again appointed as Treasurer. Reporting that the Institute is in a good financial position thanks to sell-out Spring and Autumn Seminars, Mr Accleton went on to announce a steady increase in membership applications along with existing members applying to upgrade their examinations much sooner than before. Dr Terry Quarmby gave a brief overview of the position of the Demolition Degree before announcing that the Council of Management has been in discussions over a potential course for senior management within the industry covering health and safety and corporate management topics, to name but a few. National Secretary and Events Director, Maureen Tong-Ralphs was on hand to announce the results of the latest election for Council Members. This year’s voting was again low on numbers, an issue talked about later within the meeting. With Adrian McLean and Mick Ulyatt stepping aside from the Council, the electorate voted for Richard Dolman to become the new Vice President whilst Erith’s Grant Styles was voted onto the Council for the first time. Both Mr McLean and Mr Ulyatt were thanked for their long and distinguished service to the Council of Management. Before the meeting closed for lunch, incoming President Gary Bishop thanked everyone for their attendance at the event and thanked David Darsey for his hard work and commitment to the Institute throughout his term in office and spoke of his pride in following him through the NFDC Presidency and into the IDE. 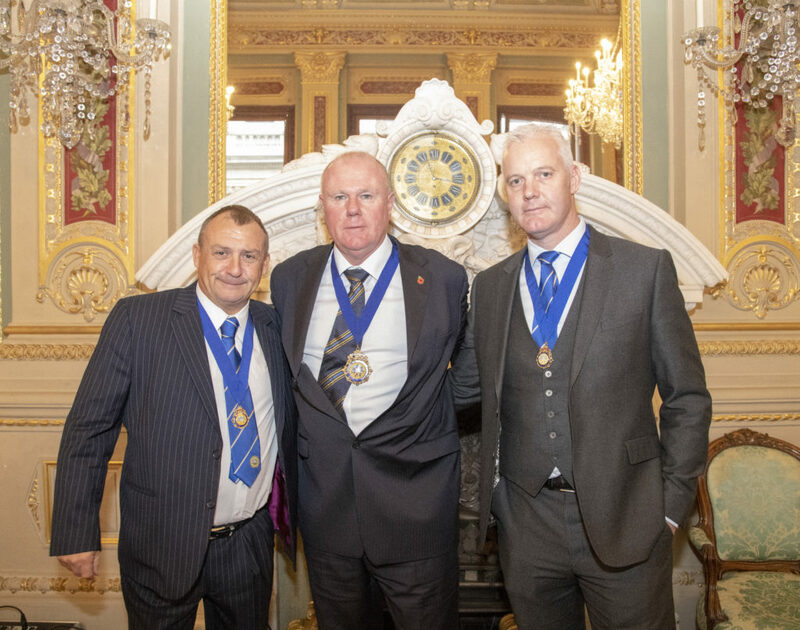 Following on from the luncheon in the beautiful Livery Hall, presentations were made to over 30 Members of the Institute who had recently passed their examinations. A special presentation was made by Adrian McLean to out-going President David Darsey in the shape of a commemorative, framed and signed photograph of Tiger Woods. A special presentation was also given to David Coleman for his work within the industry. As is tradition at the luncheon, the after dinner raffle and £20 in an envelope showed the Member’s generosity to the full and raised over £2000 for NPUK which will be supported in his first year as President by Gary Bishop. A charity auction for a number of highly sought after items including Premiership match day tickets and a ceramic poppy raised added over £3000 to the already generous donations made by the guests. Both the incoming and outgoing Presidents also thanked the sponsors of the year’s events for their generosity including ECY Haulmark, Erith, Square Mile Broking, Swanton Consulting and Worsley Plant.